Swearin' Reunite On 'Fall Into The Sun' A rejuvenated Swearin' packs its first record in five years full of indie-rock rippers from an older and wiser vantage point. Swearin's Fall Into the Sun comes out Oct. 5. 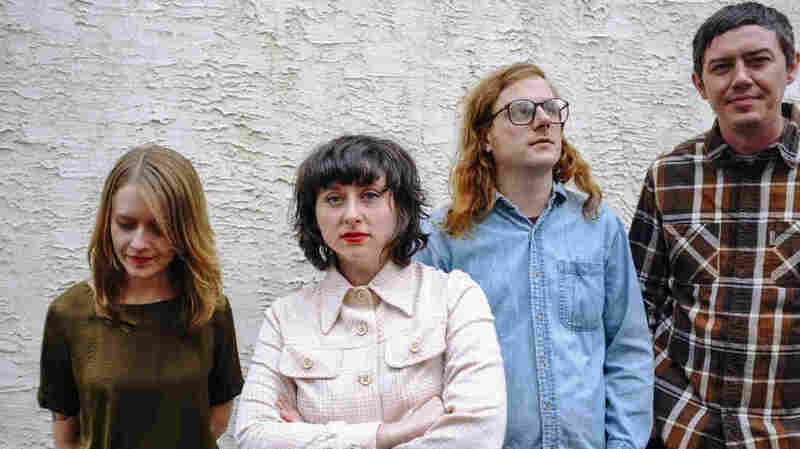 Five years ago, songwriter-guitarist Allison Crutchfield sang, "When you get older / You'll realize this wasn't love" on "Loretta's Flowers," an echoing, elegiac tune from Surfing Strange, the 2013 album by her band Swearin'. A year later, they were no longer a band; after an acclaimed run of tearing up sweaty basement gigs, Swearin' parted ways musically as Crutchfield and co-frontperson Kyle Gilbride drifted apart romantically. Five years later, Crutchfield's take is more nuanced. "Unconditional love only exists in movies," she sings on the tender acoustic ballad "Anyway," the penultimate song on Fall Into the Sun, the new album by Swearin'. "Your love for me was a remedy / A bright white light you followed idly." It's a similar, deeply reflective piece of music, centered around a moving performance by an unaccompanied Crutchfield. But in the way the reverb-soaked older tune contrasts the crisp presence of the newer one, Crutchfield's lyrical outlook in 2018 is more willing to take a clear and complete look at the situation to parse what happened, and why. That approach carries across Fall Into the Sun, which a rejuvenated Swearin' packs full of indie-rock rippers and raw energy tracing the path of their lives from an older and wiser vantage point. Gilbride breaks down feelings of scorn and despair on the cowpunk-tinged "Smoke or Steam": "We are wounded and open, wondering 'Will we heal? / Or, if nothing else, feel more like ourselves while we are here?'" Crutchfield examines the paradox of "the other woman," but with a dose of empathy, on the jaunty pop of "Margaret": "What makes it worse is in an alternate universe / She and I would probably be friends / (I wish we could be)." The record is almost evenly split with songs from the two – it's an 11-track set, with Crutchfield taking lead on one extra — and their differences as writers could not be more evident. Gilbride prefers low-tone slow burners that paint free-flowing, oblique images with an economy of words; Crutchfield's songs sprint where her bandmate's stroll, and her lyrics are detailed and vivid, naming specific places and emotions for a highly relatable perspective. So does its clear-eyed document of personal contrasts and interpersonal discord make Fall Into the Sun a DIY scene take on Richard and Linda Thompson's Shoot Out the Lights? Perhaps, but that would sell the record short, since it explores broader-reaching topics that have nothing to do with the aftermath of a relationship. Crutchfield's infectious jammer "Grow Into a Ghost" touches on mortality and fear to a propulsive rhythm by drummer Jeff Bolt, and those sentiments are echoed in Gilbride's pensive "Treading." The Breeders-esque "Untitled (LA)," and the Archers of Loaf-y "Stabilize" both meditate on loneliness, on anxiety. These are concerns on the mind of any reasonable human approaching their 30s, and with the benefit of time and perspective, Swearin' is able to unpack them into the best songs of their career.